As part of a routine physical examination, behavioral concerns are always addressed at Fieldstone Animal Hospital. Some of the more common behavioral problems include inappropriate urination or defecation, aggression, separation anxiety, inappropriate chewing and barking, and introduction of new pets into the household. Our staff is particularly attentive to feline behavior problems including destructive habits and tendencies. We offer client education and guidance for feline issues including scratching and fabric/houseplant chewing. We also offer an outline of the top household hazards for cats so that each pet owner is aware of common dangers that may present a threat to their cat's health and wellbeing. The caring staff at Fieldstone Animal Hospital will work closely with you to understand the source of these behavior issues and develop a specific plan to help eliminate your pet's unwanted behavior. Some behavioral problems, such as inappropriate voiding, can be linked to a medical issue (such as cystitis, bladder stones, or kidney disease) and treated medically. For other behavior issues, the treatment plan often includes behavior modification and may include medication-assisted training. If our veterinarians and technical staff members cannot help with your pet's behavior problem, we can refer you to a board-certified animal behavior specialist. A lost pet is more than an inconvenience. It's the number one cause of pet death. This is why the team at Fieldstone Animal Hospital views microchip lost pet IDs as a standard of protection for your pet. With a microchip, your pet can be identified quickly and easily by animal control officers, shelters, or veterinary hospitals. Microchips are safe, unalterable and permanent identification for pets and the entire implant procedure takes less than 10 seconds. 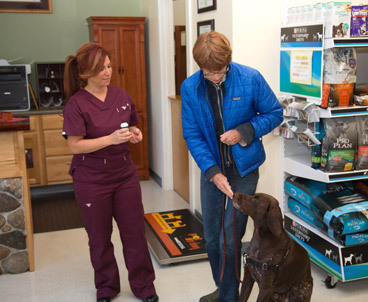 Fieldstone Animal Hospital uses the HomeAgain microchip system. The HomeAgain ID system uses microchips that register the animal with a unique identification number that is filed in a database with important contact information. This information can be updated at any time. HomeAgain membership also offers benefits such as proactive pet recovery and free access to ASPCA Poison Control. Additionally, it comes with a number of very useful services to pet owners such as their National Pet Recovery Database, Lost Pet Specialists, Rapid Lost Pet Alerts, Lost Pet Medical Insurance, Travel Assistance for Found Pets, and more. HomeAgain uses technology that is standardized around the world so that your pet's microchip can be read at shelters in many countries. They never expected their dog to escape from the comfort of the car at a local shopping plaza… She was found running through the parking lot near the highway. When a good Samaritan brought the dog to our hospital, we immediately scanned her. Thanks to her microchip, we instantly identified her. Long story short, she was returned to her worried – and very grateful – owner in less than one hour. Fieldstone Animal Hospital has an active weight management program that includes nutritional consultation, individualized diet plans, weigh-ins, and follow ups. Why is this important? Pets are living longer, healthier lives than ever before—largely due to our expanded knowledge of proper nutrition to overall health. Nutrition is the biggest health variable controlled by a pet's caregiver. During your pet's comprehensive physical examination, we can evaluate his or her body condition and give recommendations based on what we see. We also offer nutritional counseling appropriate for the life stage of your pet, illness-related diets, weight loss, and allergy-related food concerns. Some pets have more serious nutritional challenges or chronic conditions that can benefit from a special diet. Pets with liver disease, intestinal problems, bladder and kidney stones, renal failure, food allergies, and diabetes can lead healthier lives while eating these foods. For most pets, our recommendations include information on proper serving size and other feeding strategies to maintain optimal body weight and nutritional health. We also help you understand the claims made by pet food producers so you can make the most informed choices. Even enivronmental conditions can affect a pet's eating habits (heavy traffic areas, noise, the presence of other animals, etc.). Our veterinary staff is here to help you navigate through any questions you may have regarding your pet and his diet. We participate in Project Pet Slim Down, a weight loss “competition” for cats and dogs that includes prizes and incentives for participants. Ask us for more information! Telemedicine utilizes phone communication and information technologies so that we can offer specific clinical evaluation. Fieldstone Animal Hospital is pleased to provide our clients with specialty cardiac evaluation and ECG services over the phone. As the prescribing veterinarian for your pet's medications, we ensure the direct link between the exam room and our pharmacy. This means your pet will receive the right medication, at the right dose, in the right form as quickly as possible. We will also guide you on the medication's use as well as monitoring its effectiveness. 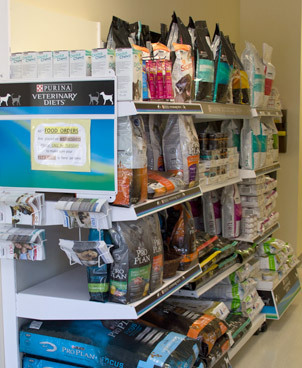 We maintain an extensive inventory of pharmaceuticals, vitamins, shampoos, flea and tick control products, heartworm preventatives and Purina prescription diets to meet the needs of your pet. Ensuring that you have convenient and timely access to competitively priced medications is an important aspect of our veterinary practice. Refills are easy, too. We are available in-house and online. Taking the time to plan, as challenging as it may be, will lessen the pain and discomfort for you and your pet in the event this option ever has to be considered. All of us at Fieldstone Animal Hospital will do our best to help you prepare for these important decisions with the compassion and sensitivity they require.